1 x Arduino UNO or similar. 1 x Metal coat hanger. 2 x 220 ohm resistors. Almost any Arduino will work, providing it has enough pins. Whilst this may look complex, it’s actually quite a simple project. I’ll start with the basic game, and then add additional components to increase complexity. You can “pick and choose” as you like depending on the components you have available. 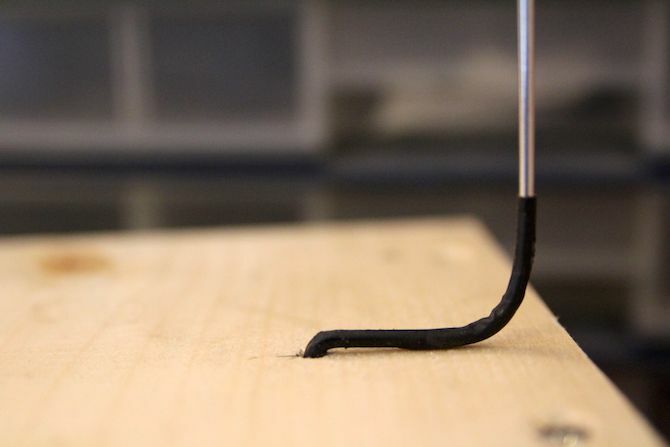 The core mechanic consists of a wire shape and a loop on a handle. The player has to guide the loop around the course without the two touching. If the two touch, the circuit is completed and the buzzer sounds. 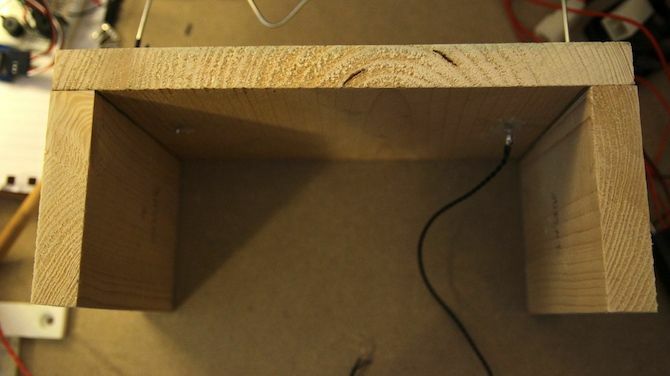 It is of course possible to build this circuit using no microcontroller, but where’s the fun in that (and how else would you get to listen to Monty Python’s “Flying Circus” theme song)? This is the shape the player will have to guide their loop round. It’s the basis of the whole game, so make it good! I chose to have a small drop, followed by a large climb. 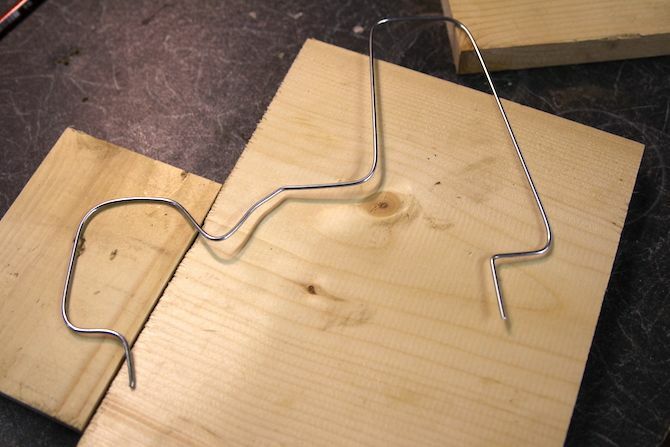 Bend a metal coat hanger into the shape you need. Brass wire or copper tube will work equally as well, although a coat hanger may be the cheapest. This will insulate the loop from the course, providing a start/end or safety zone. Alternatively, tape or even a straw will do if you do not have any heat shrink tubing. Now attach a cable to one end of the course. You have two options here: you can either solder, or use a crocodile clip. 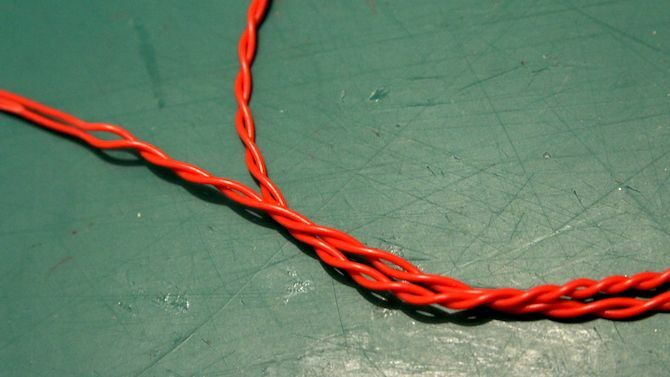 A crocodile clip is the easier option, but soldering is a more reliable and long-term option. 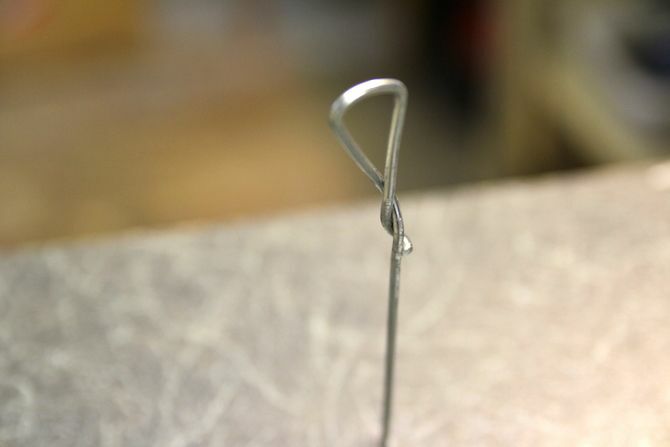 Make sure to “rough up” the surface of the coat hanger first with sandpaper, and use plenty of flux. It’s time to create the base. This serves to hold the course in an upright position, as well as providing a place to anchor the electronics to. I used some pine offcuts, although you could use whatever you have around the house — even a cardboard box. Cut three pieces to form an “n” shape. Simply screw (or glue) these three pieces together. Remember to drill a pilot hole in the side pieces first to prevent them splitting. You may want to countersink the screws (especially if you will be filling and then painting), and I highly recommend a countersink drill bit. 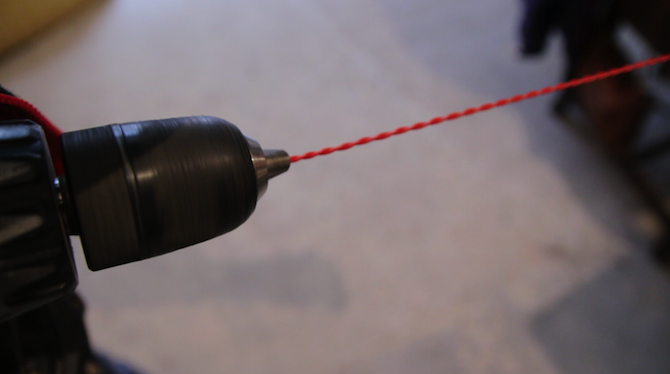 If you do not have a countersinking tool or drill bore, a larger diameter drill bit will do the trick. Drill two holes far enough apart for the ends of the course to sit into. Countersink the underside ready for glueing. Now it’s time to make the loop/controller. 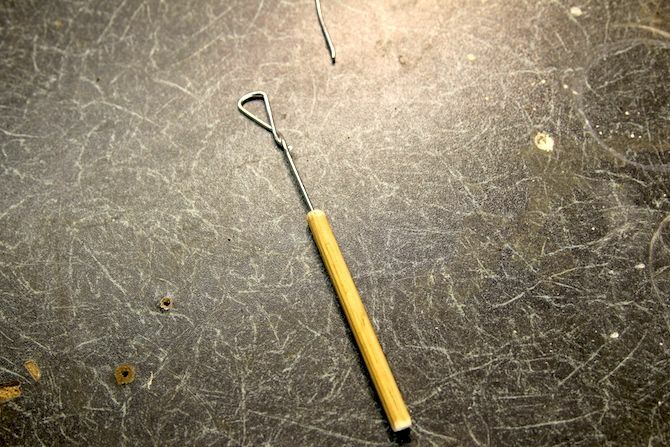 Twist a small piece of the coat hanger at one end to create a loop with a small metal handle. Make sure you file the cut edge, and then cover it with tape/foam if necessary. This will form the other half of the circuit — when this loop touches the course it will complete the circuit (exactly like a switch). Solder (or use a crocodile clip) another wire to the bottom of this, exactly the same as you did previously for the course. Cut a small length of dowel for the actual handle. This metal loop will slot into this handle. 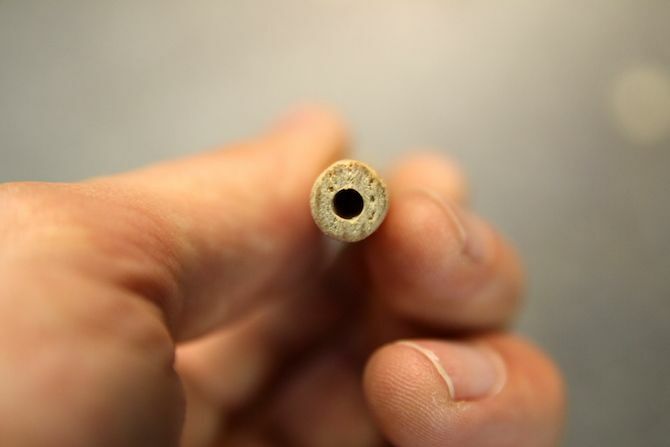 If you do not have any dowel, you can round off a piece of square softwood using a belt or disc sander (you could also use sandpaper, but it would take a long time). 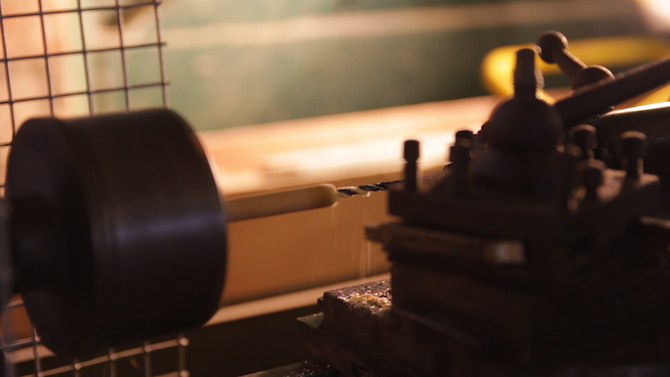 Yes, I’m quite aware this is a metal lathe (for anybody interested, it’s a Boley watchmaking lathe from the 1930s. I think it’s a 3C, but I’d love to hear from you if you know any more about it). You could also use a ballpoint pen with the center removed. Finally, use hot glue to secure the cable and the loop into the handle. 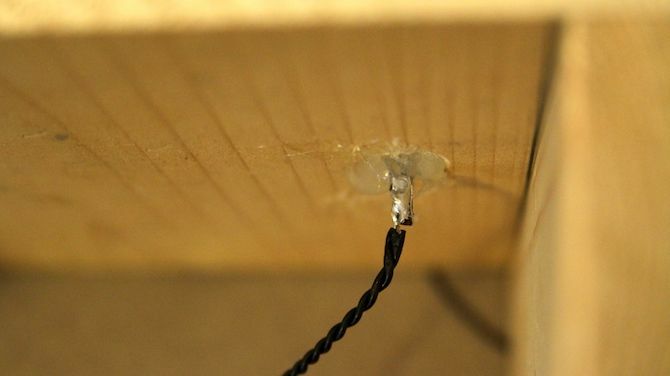 Hot glue will provide a strong (but not permanent) fixture, so it’s perfect for this. Here’s the full circuit. You do not have to make yours as complex as this — read on as we break down each part. You do not have to use two piezos — the only reason I’ve done so is to have a much louder buzz sound when the wires touch. Connect one side to the digital pin, and the other to ground. Again, it does not matter which way round these two are wired. 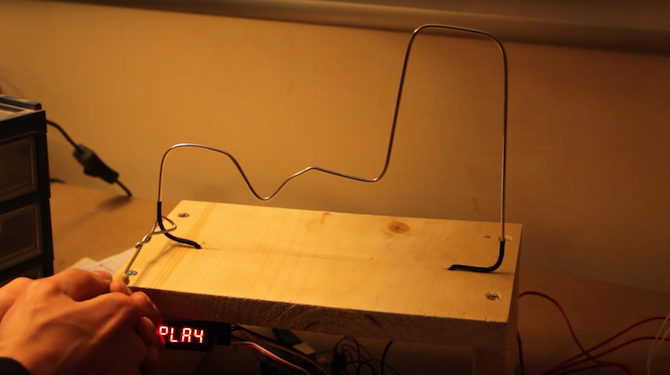 This part of the circuit is exactly like a button or switch — the player completes the circuit when the loop touches the course. Make sure you include both resistors. One resistor ties the circuit to ground (called a pull-down resistor), ensuring it is not “floating” (this allows the Arduino to detect the circuit changing). The other resistor protects the Arduino. When the two parts touch, +5V goes into the digital pin. If this resistor was not present there would be a dead short — your computer would disconnect the USB socket for drawing too much current if you are lucky. Connect the signal lead (purple, on the diagram) to digital pin 9. This particular model is from Seeed. This uses a TM1637 to drive four displays — this means only two digital pins are needed. 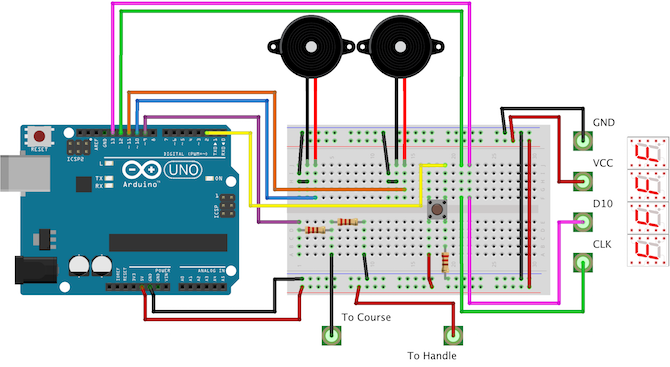 Connect GND to Arduino ground and VCC to Arduino +5V. Connect D10 to Arduino digital pin 13 and CLK to digital pin 12. To make this project work you will need two additional files. The first is called pitches.h. This file simply maps note names to their piezo value. This makes it much easier to write a tune, as you can simply say “NOTE_C3” rather than “31”, for example. This is in the public domain, and is available on the Arduino website here. Follow the instructions to create a new file called pitches.h (alternatively, paste the code into your existing script). The last library you need is to control the seven segment display — you can skip this step if you are not using one. This library is called TM1637 and was created by Seeed, the same company that created the driver board. In the Arduino IDE, go to “Manage Libraries” (Sketch > Include Library > Manage Libraries). This will bring up the library manager. Allow it a few seconds to update and then search in the top right search box “TM1637”. Two libraries will be found — you want “TM1637” and not “TM1637Display”. Select and then click “install”. One last task with this library — it’s not complete! As it stands, the library can only display numbers 0–9 and letters A–F. If this covers everything you would like to display, then you can skip this step. If not, you will need to modify the code. Relax! This is not as hard as it sounds, and if you can write code using the Arduino IDE, you can do this. First, open your library folder. This will be in your Arduino folder. On Mac OS X, this is in /Users/Joe/Documents/Arduino/Libraries. Open the folder called TM1637. You will need to edit the file called TM1637.cpp — you can safely ignore the other file with the extension .h. Open this file in your favorite text editor (for me, that’s Sublime Text 3), Notepad, or the Arduino IDE. You can now save and close this file. After each element, the comment describes what character this is. The next part of the comment is the index of the element. 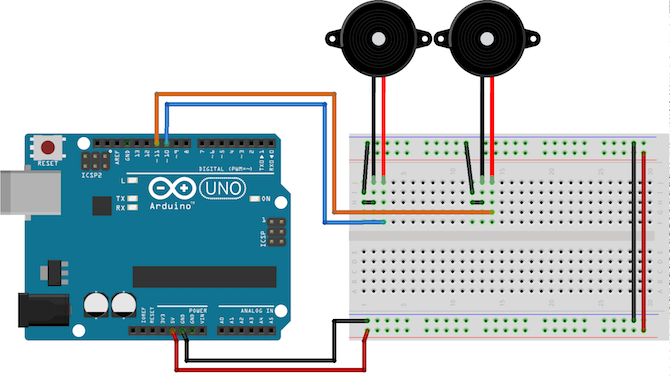 Don’t worry if you don’t understand the syntax — this line tells the Arduino that pins 12 and 13 are attached to a seven segment display, and to configure it appropriately. Note that I have removed the contents of the arrays, see below for the full code. The variable previousMillis1 will be updated at a later stage to store the current time. The interval1 variable stores how long to wait between code execution — in this case, 1.5 seconds. It is defined as const, which means it is constant and will never change — this allows the Arduino to further optimize the code. The methods set, point, and init are all contained within the _display object. Instead of a dot, a pointer (“->”) is used to access these. Again, do not worry about the syntax (although, if you would like to learn more, look up C++ Pointers). The main loop has two game modes: challenge and free play. Free play allows the player to play an unlimited amount of times. Challenge mode sets a timer for 20 seconds using the showCountdown method. It uses the button to start and stop the timer. currently, the only way to change game modes is to manually edit the variable called mode. See if you can add another button to do this and modify the code appropriately. The buzz method plays the notes given to it. This is used in conjunction with sing. The sing method goes through every note and plays it. This method is called regularly, although it will only play the next note when enough time has elapsed since last playing. Once the song has reached the end, it resets the song to verse 1 (songState = 14). You could set this to zero to start the song at the beginning, however the reason for doing this is to skip the introduction. 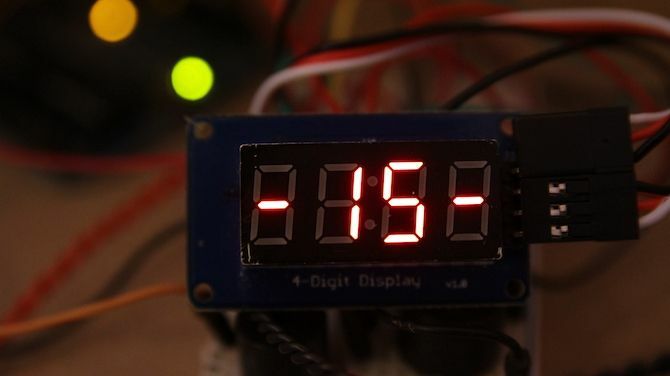 The introduction is played once after the Arduino has powered up, and then it is not played again. The showFree and showPlay methods simply write the words “FrEE” and “PLAY” to the display. Notice how the “r” in free is lowercase, when all the other characters are uppercase. This is one of the limitations of seven segment displays. They cannot show every letter of the alphabet, and some of the characters they can display have to be in mixed case. The toggleFreePlay method flashes the display between “FREE” and “PLAY”. Again, it does this in a non-blocking way. The display is not smart enough to know how to show large numbers, it has to be explicitly told what to do. This method uses some simple logic to show the appropriate number on each character. The final method used is called showCountdown. This starts a counter at 20, and decreases it by one every second. If this reaches zero, it buzzes three times, to indicate that the time has run out.